The Enlarged City School District of Middletown, New York is showing the nation how to transform a once-struggling district. Proving that good things come in small packages, this economically challenged district is improving on important metrics — for example, 4-year high school graduation rates have increased from 51 to 80 percent over the past nine years. Now aiming to drive achievement and student engagement even higher, Middletown is implementing personalized learning through a comprehensive, phased approach to blended learning to help students meet the demands of New York’s Common Core standards and aligned assessments. 91 percent of teachers in the blended learning program report they are more effective. 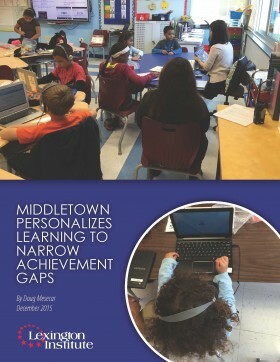 Three-fourths of students in Middletown’s blended learning program outperform their peers in non-blended classrooms in math. Students improved reading achievement by 136 percent overall on the NWEA MAP assessment. 89 percent of teachers report an increase in student engagement. This entry was posted in Education, Personalized Learning Case Studies, Studies. Bookmark the permalink.